Dual-fuel customers of the big energy firms have missed big savings by not switching suppliers, early evidence from a competition inquiry suggests. The Competition and Markets Authority (CMA) has been investigating the energy market since last summer. It says that from 2012 to 2014, more than 95% of dual-fuel customers of the big firms would have have saved money by switching tariffs or suppliers. The savings they missed ranged from £158 to £234 a year per customer. Richard Lloyd of consumers' association Which? said the energy industry had failed its customers and the regulator would have to be much tougher. "Politicians and regulators have put too much faith in competition driving keener prices for consumers - this simply hasn't worked," he said. The investigation by the CMA was formally launched last July in response to an earlier referral from the energy regulator Ofgem. 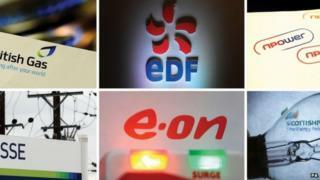 Ofgem had been concerned because of widespread disquiet at the dominance of the industry by just six big operators. Currently the "big six" energy firms - SSE, Scottish Power, Centrica, RWE Npower, E.On and EDF Energy - together account for about 92% of the UK's energy supply market. Consumer groups and politicians have frequently accused the firms of using their position to raise customers' prices swiftly when wholesale energy prices go up, but being slow to cut them when their costs have come down. That issue will form part of the next stage of the CMA's investigation. But Energy Minister Ed Davey said that if the competition authority eventually found any energy firms were abusing their market power, one course of action could be to split them up. "If the evidence from the CMA is strong that the next step ought to be breaking up a company, if the Competition Markets Authority recommend that, certainly I as a Liberal Democrat, talking to the voters in the next election, will make it clear, we would not flinch from taking that tough action," he told BBC's Radio 4 Today programme. The update summarises the CMA's thinking so far and points to issues for further investigation. The CMA highlights the position of millions of "sticky" customers who were inherited by the big suppliers following the privatisation of the energy industry in the 1990s. Many of these customers, who are on standard variable tariffs, rarely switch or even think about doing so, and are therefore missing the opportunity to save money. Between 40% and 50% of electricity customers have been with a supplier for more than 10 years. For one supplier the figure is as much as 70%. The CMA says these customers are "less educated, less well-off, more likely to describe themselves as struggling financially, less likely to own their own home, less likely to have internet access, more likely to be disabled or a single parent". They are "more likely... to think switching is a hassle, that there are no real differences between suppliers and that something may go wrong if they switch". The CMA will now look at why so many customers think this way when in fact switching is easy. Dieter Helm, Professor of Energy Policy at Oxford University, said: "Switching is never going to be enough. What is needed is a simple, transparent default tariff, indexed to the wholesale price, with a published fair margin, to protect the vulnerable and those who remain loyal to their suppliers"
The CMA has not formed a view on the profits of the big six suppliers, saying that "we are continuing to look at whether overall profit in energy retail has exceeded an appropriate benchmark". It will also investigate the idea that recent decisions by the energy regulator Ofgem to simplify tariffs have done more harm than good by reducing the number of them available to consumers. The CMA's thinking is more advanced on power generation. It does not think so far that firms have been making excessive profits from generating electricity. It also says that the evidence it has reviewed does not suggest that wholesale prices are opaque or that the market lacks liquidity. It also sees no significant issues with the big energy firms owning both power generation and supply arms. A break up of the big six is therefore unlikely, the BBC understands. Poor customer service by the big six firms is highlighted by the CMA. It says the number of complaints recorded against them rose fivefold between 2007 to 2013. These were mainly about problems concerning billing, customer service and payments. "We note that increasing numbers of complaints may reflect: declining quality of service; price rises; changes in reporting standards; increasing media scrutiny of the sector; or a combination of these factors," says the report. Shadow energy secretary Caroline Flint said: ""In a transparent, competitive market, you would expect loyal customers to be getting good deals. "And clearly, as I have been saying for the last three and a half years, that is not the case."